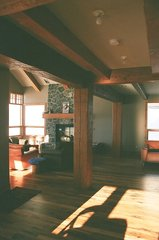 This versatile and cost-efficient style is typified by site-built conventional 2x6 wall framing integrated with placed posts, beams, timber assemblies or core frames. It offers the flexibility of quick stick-framed construction and beautiful exposed craftsmanship. Conventional house plans can be easily altered to hybrid style.